Utagawa Hiroshige (1797-1858) Kacho-e of Mandarin Ducks Swimming Among Water Grasses, Chuban. 1830’s. 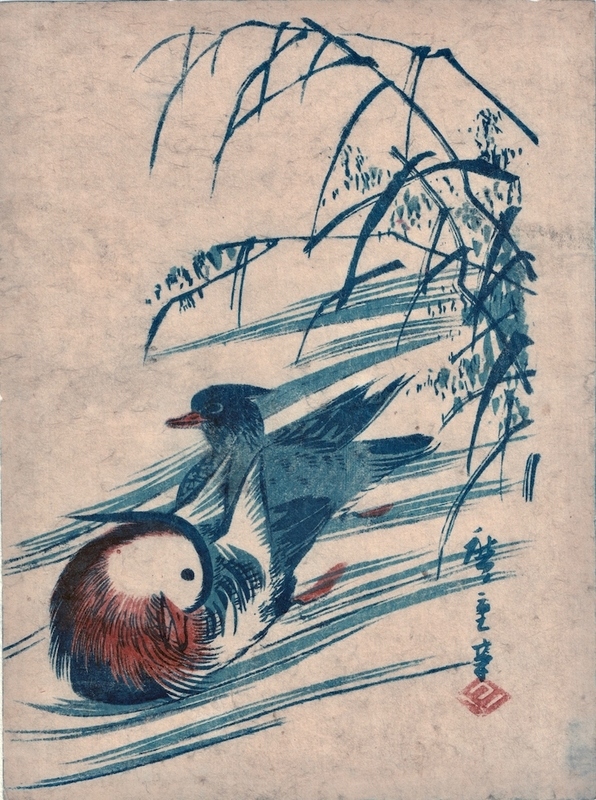 A pair of mandarin ducks swim among reeds at the edge of a pond.This delightful print is from a genre known as kacho-e, popularised by Hokusai, but common in Japanese painting since the seventeenth century. The subject matter of kacho-e is always birds or flowers and Hiroshige who saw himself as a successor to the great Hokusai, was a sensitive and highly skilled exponent of the genre. These bird prints are delicate and exquisitely observed. Beautifully printed, full size with good margins, very fine colour and impression. Very good condition.